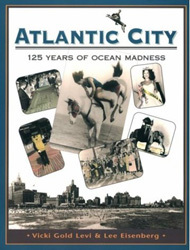 A large selection of books about Atlantic City are shown below. Atlantic City was born in the mid-nineteenth century and grew so big, so fast, that it captured the American imagination. It was 'the World's Playground'. Its hotels were the largest and finest, its nightclubs legendary, its boardwalk an endless promenade. And then, as it began to fade, the casinos came. And instead of reviving the city they killed it. Chief among the villains in this piece is Donald J. Trump, who built his casinos on dunes of debt and bled them into bankruptcy. On the presidential campaign trail Trump boasted of his 'success' in Atlantic City, how he had outwitted Wall Street and leveraged his own name for riches. He would do for America what he had done for Atlantic City, he said. And so it came to be. Brian Rose has documented what remains of the city in the aftermath of the casino explosion. The images are haunting. Atlantic City may never recover. New Jersey is home to classic and legendary boardwalks -- explore all of them, past and present, in this useful and informative? The high-stakes battle between two casino titans over the Vegas of the East Coast. It's all quiet now on the eastern front of the American gaming industry (Atlantic City, New Jersey) but for five chaotic years, real estate developer Richard "Skip Bronson" was at the white-hot center of a titanic clash of money and power that transformed Atlantic City from a struggling day-tripper place with buses in and out to a born again destination drawing tourists from New York, Philadelphia, and other major cities along the eastern seaboard. From 1995 to 2000, two of the world's best-known companies, the Mirage Resorts and Trump Resorts, run by two of the most flamboyant businessmen of our time, fought a bare-knuckled, high-stakes battle over a prime piece of real estate in one of America's most famous resort towns. 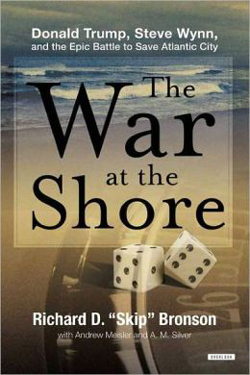 No money was spared, no punch was pulled, no invective went unhurled in "The War at the Shore." Providing the inspiration and source material for the HBO series produced by Academy Award winning director Martin Scorsese and Emmy Award winning screenwriter Terence Winter. 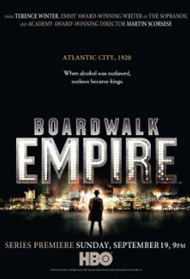 This riveting and wide-reaching history explores the sordid past of Atlantic City forever a freewheeling town long-dedicated to the fast buck from the city's heyday as a Prohibition-era mecca of lawlessness to its rebirth as a legitimate casino resort in the modern era. A colorful cast of powerful characters, led by Commodore Kuehnle and Nucky Johnson, populates this stranger-than-fiction account of corrupt politics and the toxic power structure that grew out of guile, finesse, and extortion. Atlantic City's shadowy past, through its rise, fall and rebirth, is given new light in this revealing, and often appalling, study of legislative abuse and organized crime. Brimming with fascinating details about the series, this indispensible show companion covers the historical background, how the 1920s was reconstructed, the realities of filming, biographies of key members of the cast and crew, and much more. One of the most anticipated shows in HBO's history, Boardwalk Empire was created by Terence Winter, screenwriter and executive producer of The Sopranos, and Martin Scorsese serves as an executive producer, as well as directing the first episode and establishing the look of the show. With a stellar cast headed by the great Steve Buscemi and including some of the finest character actors in the business, the show has proven to be ever bit as smart, brutal, and thrilling as had been anticipated. Already renewed for a second season, it is set to become one of the defining series of the decade. 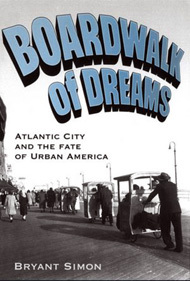 During the first half of the twentieth century, Atlantic City was the nation's most popular middle-class resort: the home of the famed Boardwalk, the Miss America Pageant, and the board game Monopoly. By the late 1960s, it had become a symbol of urban decay and blight, compared by journalists to bombed-out Dresden and war-torn Beirut. Several decades and a dozen casinos later, Atlantic City is again one of America's most popular tourist spots, with thirty-five million visitors a year. Yet most stay for a mere six hours, and the highway has replaced the Boardwalk as the city's most important thoroughfare. Today the city doesn't have a single movie theater and its one supermarket is a virtual fortress protected by metal detectors and security guards. With the opening of the first casino in 1978, the urban balance once again shifted, creating twelve separate, heavily guarded, glittering casino worlds walled off from the dilapidated houses, boarded-up businesses, and lots razed for redevelopment that never came. Tourists are deliberately kept away from the city's grim reality and its predominantly poor African American residents. Despite ten of thousands of buses and cars rolling in every day, gambling has not saved Atlantic City or returned it to its glory days. . 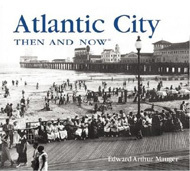 This book is an affectionate visit to Atlantic City during the days when it was the most famous resort in the world. It is album of hundreds of old photographs and knowing text about the piers, boardwalk, hotels, the show business characters, the visiting celebrities, the Misses America that were crowned here and much more. Fascinating then-and-now photographs highlight Atlantic City's evolution from its early days as a get-away for Philadelphians, through its decline in the mid-20th century, to its 21st-century incarnation as a gambling and entertainment mecca. Stroll along the City's famous Boardwalk! First built in 1870 to keep sand off hotel carpets, the Boardwalk has witnessed tremendous changes. Check in to some of the Eastern Seaboard's most extravagant turn-of-the-century hotels like the Traymore, the Marlborough-Blenheim, and the Shelburne. See how Donald Trump turned swampland into gold, with photographs of the once impoverished Inlet area that now boasts high-end resorts. Take a spin on the world's first Ferris wheel, at Missouri and Mississippi Avenues, now the site of the Trump Taj Mahal casino. Glimpse icons of the past, like Boardwalk Hall, home of the Miss America Pageant and the Chesterfield sign, once the world's largest electric sign with 27,000 light bulbs. Few American resort cities rival the romantic slpendor of Atlantic City, New Jersey. Since 1854, this island has evoked dreams and memories of days lived amid white sand beaches, a vibrant boardwalk, exciting amusement piers, and grand hotels. For decades it was a place where teenagers fell in love, returned for honeymoons, and later brought families. Atlantic Cities is a nostalgic return to the pre-casino days that now seem relatively innocent. The founders believed that the city would become a grand health resort, featuring healthful sea breezes and balmy days. Nearly deserted when the first train loaded with day-trippers arrived on July 1, 1854, Atlantic City, by 1900, was known throughout much of the world as "The Queen of American Resorts." With huge hotels lining the Boardwalk and unique amusement piers jutting into the ocean, the city thrived on what one promoter called "ocean, emotion, and constant promotion. For much of the 20th century the Steel Pier in Atlantic City, NJ, was the center of American entertainment on the East Coast. There were big bands, movies, sideshows, acrobats, flag-pole sitters, Frank Sinatra, Miss America -- and throngs of people lining up to get a seat so they could watch brave horses and riders dive into a pool of water. It was aptly called the ''Showplace of the Nation'' and it was all that and more. This all-in-one entertainment mecca, novel in its day, has never been matched, not even at latter-day theme parks. Where else could you take the entire family for a day and see fortune-telling parakeets, the World of Tomorrow, John Philip Sousa and his band, a bear on a bicycle, World Famous Diving Horses, take a ride below the sea in the Diving Bell, spend the evening in the marine ballroom, and take in a movie -- all for one ticket? It was a colossal offering of escape, popular culture, fun and fantasy. Today, the novelty and innocence of the golden age of the Pier seems a world apart. Yet it was an institution -- a grand treat served up with gusto and cotton candy, a destination not to be missed -- and an empire of grand-thinking impresarios, oddities and glamor that meshed into one cohesive and attainable summer destination. 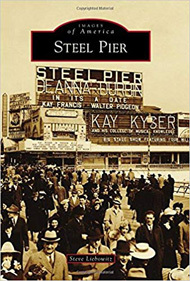 Steel Pier, Atlantic City -- this large-format coffee-table book -- is published in full color and includes 227 historic photographs, illustrations, poster and advertising images. Steel Pier evokes a time when more really was more, a time when there was so much invention, talent and industry that it could only be experienced in one place -- at the edge of the continent, in a city that took its name from a vast ocean, on a great pier reaching out into the sea. Atlantic City has worn the tag of "America's Playground" since its earliest days, so it is only natural that its biggest and most well-known icon, the Steel Pier, would be known as the "Showplace of the Nation." Over the course of 80 years, from 1898 to 1978, Steel Pier developed from a quiet, genteel amusement that featured light classical music and cakewalks to a vast entertainment complex that offered movies, big-name vaudeville acts, exhibits, big bands, rock bands, and the Water Circus with its famed diving horse. What makes this even more compelling is that one could spend the entire day on the pier and take all of this in for one small admission. Rise & Fall of Atlantic City. A richly layered epic, The Last Good Time brings to life a fascinating place and its politics, people, and culture, through the portrait of one of Atlantic City's most famous families - the powerful, flamboyant, sometimes lethal D'Amatos. Paul "Skinny" D'Amato created and presided over the 500 Club that served as the ultimate back room for some of the great Rat Pack performers - Dean Martin, Sammy Davis Jr., and Frank Sinatra - as well as other big players in entertainment, politics, sports, and the mob. The Last Good Time is a classic tale of the whiskey-soaked dark side of midcentury American Popular culture. A personal history of Atlantic City during its heyday as the nation's center of popular entertainment, Chance of a Lifetime focuses on the decades before and after World War II. This was the city's heyday, when celebrities and tourists flocked to "America's Playground" -- and political corruption, illegal gambling, bootlegging, and prostitution were all sanctioned as part of the Atlantic City experience. 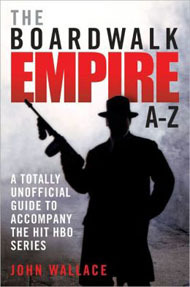 As Skinny D'Amato is quoted in the book: "Atlantic City was Las Vegas. This town was wide open." Beginning with the early attractions of the anything-goes resort, the author explores the rise to power of notorious political boss Enoch "Nucky" Johnson. This sets the scene for the rise of entrepreneurial Paul "Skinny" D'Amato and his famed 500 Club -- a venue that encapsulated everything good, bad, and fun about the legendary resort town. created a vibrant city within a city a place where black culture could thrive and young people could aspire to become artists, athletes, educators, and leaders of business, politics, and society. As Nelson Johnson shows in this unflinching portrait, Atlantic City was built on their toil and the Northside was born of their dreams. In his first novel, J. Louis Yampolsky evokes the days when Atlantic City was the "Playground of the World"--the home of gilded Arabesque hotels, parades, pageants, and the famous Steel Pier. A Boardwalk Story is a startling debut from a remarkable new voice in American fiction. 1939. The tenth year of the Great Depression in America. Europe teeters on the brink of war. In Atlantic City, New Jersey--a seashore resort town that springs to life every summer--Jack Laurel comes of age. At 15, Jack's life is turned upside down by an almost magical convergence of people and events. A mysterious boardwalk entertainer inspires a love of literature, a feud with neighborhood bullies escalates, and innocence is lost. Jack stumbles into commodities trading with two men: one a reclusive mystic, the other a charismatic pitchman and mathematical savant. The musings of a boardwalk fortuneteller set the three partners up to reap unimagined profits--but a house of cards is about to come down around them and, with it, the wrath of an iron-fisted crime boss. This book was the 2010 NJSAA Best Fiction Award Winner! How greed, corruption, and the mafia turned Atlantic City into The Boardwalk Jungle. 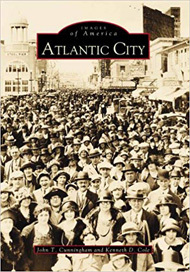 Acclaimed journalist and author Ovid Demaris, the man who revealed Las Vegas to the world in The Green Felt Jungle, now gives us the shocking true story of how Atlantic City went from seaside haven to Mafia Mecca. From licensing hearings to wiretapped conversations, from the governor's office to the gaming tables, the author names names and shows us the chilling truth of how greed, money and terror conquered the state. 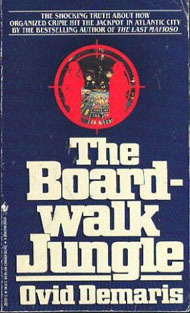 The Boardwalk became a multi-billion dollar capital of crime, as bad if not worse than Las Vegas. Atlantic City was founded in 1854 and soon became a seaside resort surpassing all others, earning the nickname "Queen of Resorts." Chronicling the glory of the city from 1900 to 1930, these vintage postcards depict a time when visitors were eager to stroll on a local invention, the boardwalk; frolic on the beach; ride a rolling chair; and buy saltwater taffy. The annual Easter parade and Miss America Pageant became Atlantic City traditions. 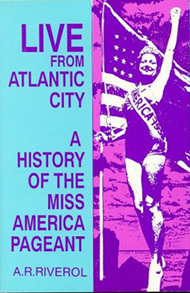 The book, "Live from Atlantic City" traces the Pageant's history from its birth as a pseudo-event in 1921 through its emergence as an American popular culture icon. and coeds have paraded up and down runways hoping to win a slice of the American Dream. and places where no television camera has focused. 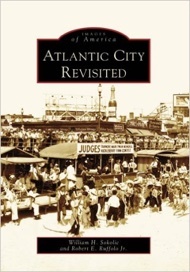 Drawing upon (and sometimes debating with) primary and secondary sources, the author paints a vivid picture of life in Atlantic City during Pageant Week. If the name Arnold Rothstein is recognized today, it's as the man who fixed the 1919 World Series (Meyer Wolfsheim in The Great Gatsby). But the Black Sox scandal was only one item on Rothstein's resume. In this scrupulously sourced biography, Pietrusza portrays the quintessential Jazz Age gambler and underworld kingpin as the black sheep in his Orthodox Jewish family. 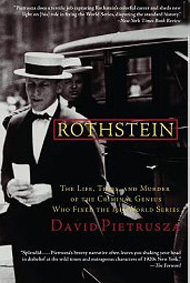 Enraged by his brother's piety, Rothstein vowed to go a different way. That he did, earning the nickname "the Big Bankroll" for his involvement not just in sports betting but also in labor racketeering, rum-running, Wall Street shenanigans, and even the beginnings of the drug trade. 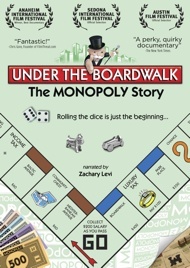 UNDER THE BOARDWALK: THE MONOPOLY STORY presents the captivating stories about the game and those who play it, culminating with the high-stakes MONOPOLYÂ® world championships held every four years. Leading up to the exciting coronation of a new champion in Las Vegas, the film follows some of the most colorful players in the game. They are lawyers and math teachers, defending champions and underdogs, all brought together by a shared love of the game.